On the 24h hotline the customer can reach a team of experts in case of loss, damage or medical condition to get support for the particular issue. Since most of GA's customers have a mobile phone with them when travelling, a major problem has been eased - the availability of the customers. In the past it was difficult to stay in touch. To keep the costs low GA has decided to use SMS to communicate with the customers abroad. The Outlook Mobile Service is the perfect tool for this purpose. The customers' contact data was managed in Outlook already. They only had to set up an ASPSMS Account and order a Global Two-Way Number as return channel. Fact: Short Message is the ideal channel to communicate with single persons or groups of variable size and locations. 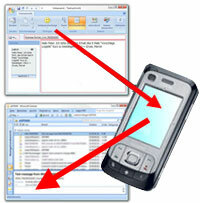 As main instrument of communication, the Outlook Mobile Service is used in combination with a Global Two-Way number (e.g. +447624000000). Outlook Mobile Service is a feature in Microsoft Office Outlook 2007 and 2010 that you use to create and send text messages to a mobile device. From within Outlook you send text messages in a manner similar to e-mail messages. By using Outlook Mobile Service, you can send a message both as an e-mail message and as a SMS/text to multiple contacts at the same time. You can stay informed when you are away from the office because Outlook Mobile Service can forward favoured e-mail messages and calendar appointments directly to your mobile phone. Globo-Assistance sends all Short Messages with their Global Two-Way Number (e.g. +447624000000) as originator. All answer SMS will be sent to the Outlook Inbox. Family Schnelli was on the way to Toulon in France for a ten day vacation. The first night they stayed with friends near Nice. The next morning they wanted to go to the beach for a swim before going on to Toulon, but the car wouldn't start anymore. After a short debate it was clear that no one had a clue. So Mr. Schnelli called Globo-Assistance. The lady assured she would organize a replacement car and a mechanic till lunch. The Schnellis went to the beach with their friends' car. Two hours later Mr. Schnelli got an SMS from GA.
SMS-OUT (to Mr. Schnelli): Dear Mr. Schnelli, we organized a mechanic and a rental car for you. The towing service will be at your car on Avenue de la Mer at 13h. The replacement car will be there as well. Please let us know if this is ok for you. Mr. Schnelli replies to the Global Two-Way Number of GA.
SMS-IN: We won't make it till 13h. How about 14h? GA re checks with the towing service and gets a new appointment for 14:30. SMS-OUT (to Mr. Schnelli): Dear Mr. Schnelli, we were able to get a new appointment for 14:30. The next possible time would be at 18h. Please let us know if this is ok for you. SMS-OUT (to Mr. Schnelli): Ok, a Mr. Rozier will be your contact person. We have already set the contract with them. You only need to sign the receipt for the rental car. 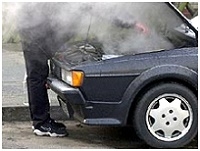 We will keep you informed about the state of the repair of your car and wish you relaxing holidays. Madelaine Gugger, Globo-Assistance. SMS-OUT (to Mr. Rozier): We confirm the appointment at 14:30h on Avenue de la Mer. Customer: Family Schnelli, car number: AG 1464512. Madelaine Gugger, Globo-Assistance. The customers are available always and everywhere. 99.9% of the customers have a mobile phone and worldwide coverage is a fact. No call retries, if a customer is not reachable at the moment he can read the SMS later. No misunderstandings due to bad line. And last but not least: SMS are low priced. Please note: if your company uses in-house solution for CRM, it will be easy to integrate ASPSMS to your CRM-solution. You just will be using one of our many interfaces available (XML, SOAP, Active-X, SMTP etc.). Mr. Schnelli was able to enjoy the beach with his kids instead of having to sit next to the phone and wait for the call. The dates and addresses are in a written form already, which avoids misunderstandings, and Mr. Schnelli didn't bring pen and paper to the beach for sure. 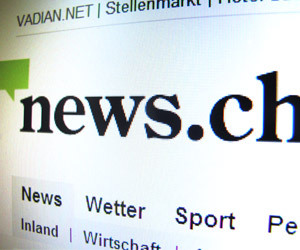 news.ch the Swiss online News Portal. Besides current news you find comments,columns and up-to-date Information about politics, economy, Sports and IT.